Considering that every economic theory agrees that living standards and worker compensation are closely correlated with the amount of capital in an economy (this picture is a compelling illustration of the relationship), one would think that politicians – particularly those who say they want to improve wages – would be very anxious not to create tax penalties on saving and investment. Yet the United States imposes very harsh tax burdens on capital formation, largely thanks to multiple layers of tax on income that is saved and invested. But we compound the damage with very high tax rates, including the highest corporate tax burden in the developed world. And the double taxation of dividends and capital gains is nearly the worst in the world (and will get even worse if Obama’s class-warfare proposals are approved). 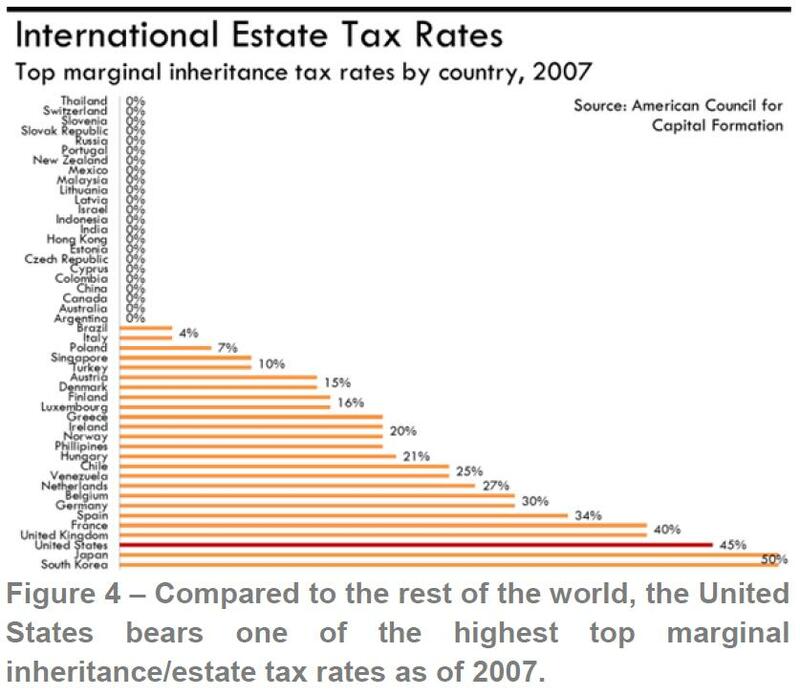 To make matters worse, the United States also has one of the most onerous death taxes in the world. As you can see from this chart prepared by the Joint Economic Committee, it is more punitive than places such as Greece, France, and Venezuela. Who would have ever thought that Russia would have the correct death tax rate, while the United States would have one of the world’s worst systems? Fortunately, not all U.S. tax policies are this bad. Our taxation of labor income is generally not as bad as other industrialized nations. And the burden of government spending in the United States tends to be lower than European nations (though both Bush and Obama have undermined that advantage). And if you look at broad measures of economic freedom, America tends to be in – or near – the top 10 (though that’s more a reflection of how bad other nations are). But these mitigating factors don’t change the fact that the U.S. needlessly punishes saving and investment, and workers are the biggest victims. So let’s junk the internal revenue code and adopt a simple and fair flat tax. The purpose of taxation is a whole myth. 1. An autonomous currency issuer like the US, GB, Japan…dont tax to fund anything, yes its true, since they just fund all their needs out of thin air. air) does not even cause inflation in the true sense. Cause what happens when the government spends? It always funds a value creation process, means the money becomes value through this process. Its the same like you working for someone else, and you would issue a promissory note for your work, that entitels the owner to demand work or goods from someone else…Thats money, and thats the process how it becomes value. So the government does the same, issues those promissory notes (= central bank money) into the economy, by spending on infrastructure, education..on things that should benefit the public. The people who work for the public, get those promissory notes (= central bank money) funded on their accounts benefiting them with a claim on labor/ goods against the public they work for. As long the spending is beneficial to the public, there wont be any inflation. Privat banks cant create inflation, they are capital constrained and only produce claims/ liabilities on the money the government spends (= central bank money). 2. so what is the true purpose of taxation? a) For an autonomous currency issuer It is to control the money supply, to control inflation. It doesnt fund anything like we were told. b) For currency users like the EUR-Group (that have lost their status as an autonomous currency issuer) in fact it means funding. But not the government, it funds the banks that stole the sovereignty from the state to fund its needs, and put him in the private banks dependence. Thus the taxpayers of the EUR-Group dont fund government spending, no they fund the private banks, that hold the government bonds (debts). As i explained an autonomous currency issuer does not spend debt constrained since it has the monopoly on its currency. That is why the inteterest rates on governemnt bonds in the US, GB, Japan are low but in the EUR-Group become higher and higher every day. Means government bonds of autonomous currency issuer dont represent any debts (even if we were told so, but the mechanics behind the money-system reveal that they dont spend debt contsrained). Whereas in the EUR-group they do represent debts. Even though it is a paradoxon because, only through government spending new money enters the economy. That chart aproves the deflational situation in europe, cause since the EUR was founded 2000, there was no new money issued into the system through the government, cause the EUR member states now were true debt constrained in its spending. But economic growth need the growth of money supply…its not working the other way round. You see what austerity caused in the USA in the Clinton era (1990th), from the picture above: when the government saves, the private sector gets robbed its savings. The liquidity crunch in the economy directly lead into the stock crash in the early 2000, and now the world wide austeirty programs since 2008 lead into a world wide expropriation of the private households. The state has to make deficits to spend to guarantee economic growth. The state never must save in order to keep its people wealthy. So question to you as a lawyer, do we have to pay taxes at all if they dont fund the government but the private banks? Is the austerity program legal? Dear neverworezubaz, free markets are not about meritocracy, they are about free people trading goods and services openly and without cohersion. Free markets do require respect of private property. Estate taxes are double taxation and confiscation of private property. if I earned it and saved it I should be able give it to who I want without a large portion of it being confiscated. It is not for you to decide what an adequate inheritance is for my progeny or what is in their best interest. Anyone that cares one iota about free markets would be for a 100% (less some fixed amount, perhaps a max $250k/recipient named in will) tax rate on estate taxes. Free markets are supposed to be about meritocracy and there’s nothing less meritocratic than getting something for nothing: Inheritance is the ultimate form of socialism. How can double taxation ever be fair? on July 29, 2012 at 12:05 pm roger o.